Master of His Domain: Art Ibleto, otherwise known as the Pasta King, surveys his kingdom. The plate in front of me is red on one side and green on the other, cradling cheese ravioli dressed in pesto and meat ravioli dressed in marinara sauce. Another plate of sliced polenta topped with pesto, marinara, and melted mozzarella cheese sits steaming to the side, its red, white, and green colors looking like an edible Italian flag. I'm not even done with half of the ravioli before Arturo Ibleto slides two polenta slices onto my plate, along with a piece of buttery garlic bread. We're in one of the huge kitchens on Ibleto's ranch off Stony Point Road in Cotati that serves as the production center for his catering operation, where the smell of garlic and basil hangs in the air. Almost immediately after I finish the garlic bread, Ibleto sets another piece on my plate. I can tell that I'll be going home very, very full. Arturo "Art" Ibleto has been a field worker, truck driver, mechanic, butcher, farmer, and freedom fighter, but he's best known as the Pasta King. If you were at this very moment to ask everyone in Northern California who has ever had Pasta King pasta to raise their hands, you'd see a sea of arms shoot up from Fairfield to Oakland to Arcata. At weddings, funerals, school fundraisers, county fairs, and political rallies, Ibleto's wholesome, hearty, and simple pasta keeps constituents gladly coming back for more. At 22, Ibleto came to the United States from the town of Sesta Godano, in the Liguria region of northern Italy. "Over there, of course it is not California," he says, reflecting on his youth. "You live off of the land. Some years are pretty good and some years are not good at all. It's tough, very tough. We were not the poorest in town--we owned a house, we owned land--so my family, we never went hungry. But there was a lot of sharecropping in those days. You had to make your own wooden shoes, you had to keep and patch your own clothes." Ibleto came of age during Mussolini's regime. "If you didn't do what they wanted to do, you don't survive very long. I was 16 years old when they got me to go in the army. That was hell. I didn't like it--I don't like war--so I deserted the army. After you desert the army, you have two choices: It's either you hide well or you die. So then I joined the underground." Specializing in demolition, Ibleto planted explosives under bridges, railroads, and in tunnels to thwart the Germans. "I fought for two years on the mountains and tried to stay alive, and tried to achieve what we are after: some liberty. And we made it, and I'm proud." The memories of that time spurred Ibleto to seek out a new life. "I saw too much. I thought, 'If I come out of this alive, I'm leaving.' I didn't care where I was going." Ibleto's grandfather, who had worked in San Mateo, used to talk about California, and Ibleto grew up hearing about places like Oakland and Colma. "We'd gather round behind the stove to stay warm in the wintertime and listen to the stories." So Ibleto moved to California, where he worked at a farm in Cotati. Then he delivered wholesale produce all over Sonoma County. In 1951 Ibleto married Vicki Ghiradelli. Eventually, they purchased acreage off Stony Point Road, and Ibleto became a butcher. As the demand for butchering declined, Ibleto decided to plant Christmas trees as a side business. "In Italy, I grew up in the mountains, and I was missing the trees more than anything else," he says. "So I planted 20,000. Many people remember me from the Christmas trees, because by the office we had a huge coffee pot and brandy, and people loved that." Though business went well, eventually the trees succumbed to disease, so Ibleto, who had always been passionate about cooking and sharing food, moved on to the next thing: pasta. In 1974, Ibleto took over the concessions at the Sonoma County Fairground's Spaghetti Palace; since then, his presence at the Sonoma County Fair has evolved into an institution. "We became No. 1 in a matter of a few years. And we're still No. 1, the oldest concession guy around, and the most popular. The first year, I think I cooked 300 pounds of pasta in two weeks. Now we cook that in half a day," Ibleto says. The runaway response Ibleto received from the Spaghetti Palace prompted him to start the retail and catering business Pasta King, which caters events, often as much as seven days a week, at locations throughout the Bay Area. "You'll tell me I'm crazy if I tell you where we go," Ibleto says. "I go all the way up to the Oregon border. I do pretty much all of the politics--congressman, senators, all them." Recently, Ibleto served 600 people at the Central Committee for the Republican Party, though political affiliation does not influence Ibleto's bookings of Pasta King. "When it comes to food, it don't matter. Talk is easy, but when you come to eat, you pretty much unify." Pasta King's offerings stand as shining examples of the best of Italian-American cuisine. Sauces are made fresh daily, as well as lasagna, polenta dishes, minestrone, and ravioli--all with high-quality ingredients and no preservatives. Pasta King's pesto is a bright kelly green, the green of a cartoon Christmas tree, and its fresh and bright flavor sings, piney and floral all at once. 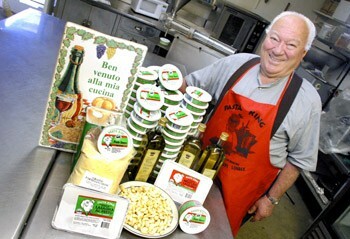 Ibleto's native Liguria is the home of pesto, and he's happy to have exposed many Pasta King customers to their first taste of the stuff. "Since I got started, people found out what good pasta means," Ibleto says. "I don't invent the pasta, but I kind of helped to teach people how to cook. Before, families ate pasta out of a can. They never used to eat pasta al dente--they used mush!" It's not just Ibleto's pronounced Italian accent that makes the way he says "pasta" such a dear word; it's the love and respect that's inextricable from his intonation. "Paz-tah," he says, verbally giving the glorious foodstuff a hug. Soon, Ibleto will be able to add wine production to his long list of occupations. Seventy-five acres of grapevines now grow in the fields where his Christmas trees once stood, and their fruit will soon make its way into Ibleto's Sonoma Bella wine (or Bella Sonoma--Ibleto keeps changing his mind). Currently, Ibleto sells his grapes to other wine producers, but Sonoma Bella's first wines--Pinot Noir and Merlot--are due out before the end of the year. "I want normal people to be able to drink a good glass of wine without paying a fortune." The majority of Ibleto's vines are across the street from the Pasta King headquarters, on a hill with an amazing view of much of Sonoma County--Santa Rosa, Cotati, Sebastopol. "On a nice day or clear evening, we see the world. This is why we call it Sonoma Bella because I think, 'Look at what you see.'" Looking out at the vineyards, a love for his land and life dances in Ibleto's eyes. "That's why I enjoy it so much here, and I tell people they don't know how lucky they are. Freedom, I think, is the most important thing in life. This is a country that if you like to work, there's plenty of work, and you can go any place you'd like to go." Ibleto would like to write a book about his life, but does not really have time. He's had quite a life to write about, and he's not anywhere near finished. Before I left the ranch, Ibleto loaded me down with pounds of pasta, pesto, and minestrone to take home, and when I told him of my fondness for eating cold polenta straight from the refrigerator, he gave me a brick of that too. But giving food away is, for Ibleto, not part of a day's work, it's just his nature. When you make pasta, people are bound to love you, and that's probably why people see Ibleto, the Pasta King, as their grandfather. Which is pretty cool, to have a king for a grandfather--especially one who makes you pasta. Pasta King products are available at Whole Foods, G&G Market, Food 4 Less, and at the retail store at his ranch, 1492 Lowell Ave., Cotati. Call first. 707.792.2712.